What Are Three Adaptations That Reptiles Have for Conserving Water? What Are the Differences & Similarities Between Mammals & Reptiles? Where Do Reptiles Typically Lay Their Eggs? What Are the Adaptations for Reptiles to Live on Land? Reptiles separated from their water-dwelling ancestors and climbed onto land during the Paleozoic era, over 280 million years ago. When that era gave way to the Mesozoic, following a mass planetary extinction, reptiles survived and continued to evolve. They dominated the earth between 248 and 213 million years ago and live on today as modern-day snakes, turtles, lizards, crocodiles and even birds. Reptile skin contains keratin, a water-resistant substance that maintains hydration. Reptiles also have scales to keep in moisture and help avoid skin damage, though the scales are sometimes too small to be visible. 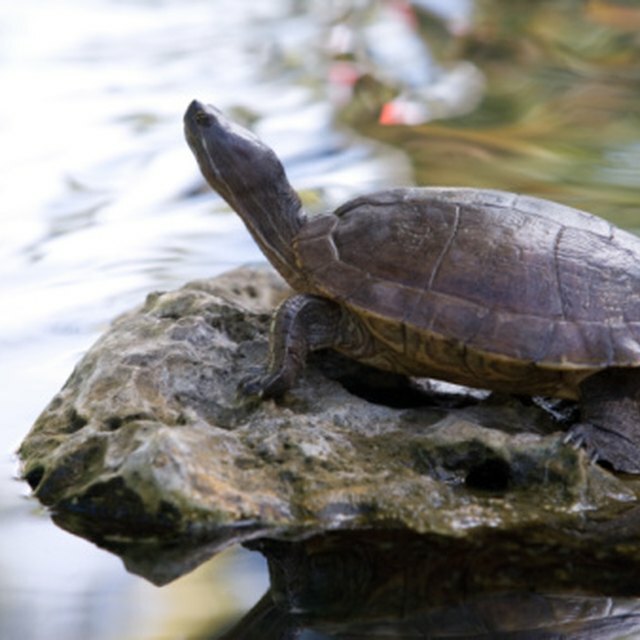 This feature is most evident in turtles, whose scales fuse to form a shell, while you can see a bird’s scales on its feet and in the form of feathers. Living on land means limited access to drinking water, so reptiles’ kidneys have adapted. They conserve water by producing less urine in more concentrated forms. Laying soft-shelled eggs is safe in water, but land-dwelling creatures require a different reproductive strategy. Scientists think this is why reptiles evolved a hard shell around their eggs, and why some no longer lay eggs at all. In many types of snakes the eggs hatch internally, and babies are born live. Adapting lungs in place of gills was a significant step in reptiles’ migration to land. While amphibians all have gills at some stage in their development, either temporarily during the larval stage or permanently through adulthood, reptiles are born with fully developed lungs. For cold-blooded creatures on land, survival requires more than just physical changes. Since a reptile’s temperature depends on its surroundings, it basks on rocks to warm its blood for hunting. Without a place to bask, reptiles can’t get enough blood flow, as anyone who keeps reptiles as pets can verify. Reptiles kept in captivity must have access to warming lights and heat-absorbent surfaces to substitute for a natural basking environment. 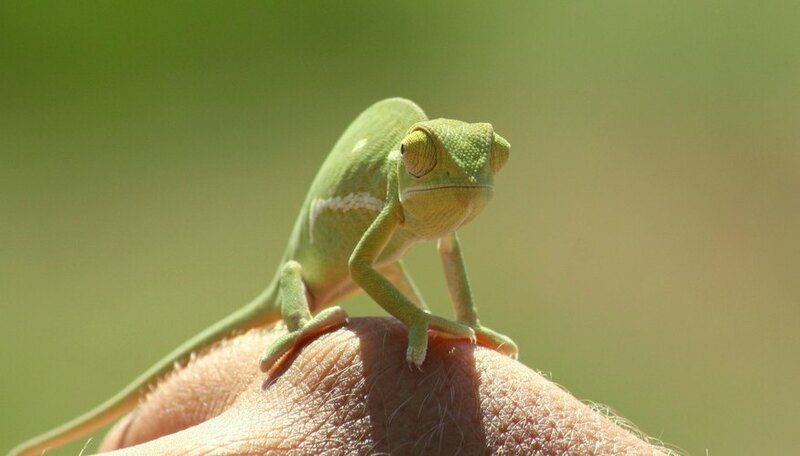 Not all reptiles have legs now, but they all needed them to become land-dwelling creatures. This was once a topic for debate due to the legless nature of snakes. Though scientists knew that snakes once had legs, they could not determine whether they lost their limbs before or after migrating to land. Scientists at Penn State resolved this issue in 2004 by comparing DNA between snakes and their closest genetic relatives. They determined that snakes lost their legs after they left the water, possibly to enable their burrowing habits, but that snakes, like all reptiles, initially required legs to relocate to land habitats. DinoBuzz: Are Birds Really Dinosaurs? Michelle Key has been writing professionally since 1999. She has written training manuals, technical guides, press releases and marketing and fundraising materials for clients including Ruby Tuesday Inc. and Great Smoky Mountains Institute at Tremont. Key attended Maryville College, where she majored in writing/communications and music. She became a certified chiropractic therapist/assistant in 2002 and spent 2009-2010 attending naturalist certification courses at the Tremont Institute. Key, Michelle. "What Are the Adaptations for Reptiles to Live on Land?" Sciencing, https://sciencing.com/adaptations-reptiles-live-land-6801666.html. 13 March 2018. What Type of Body Coverings Do Amphibians Have?